While digital transformation is a journey, there are specific steps organizations can and should take now to simplify and accelerate the transition. 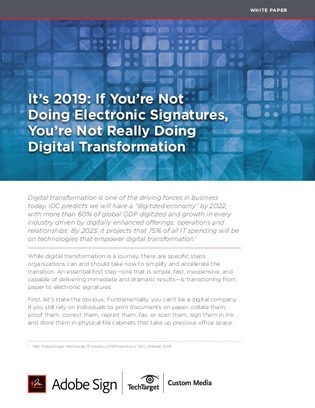 In this white paper, learn how transitioning from paper to electronic signatures can streamline your digital transformation and accelerate your speed of business. Explore 7 business benefits of electronic signature, and review 5 characteristics to consider when selecting an electronic signature software.